Actually, Everything. I Get To Everything. It’s Over. This Is The End… Frak. How Did That Happen? I Mean, I Don’t Finish Things. I Don’t. That’s Like, My Thing. Not Finishing. A few days ago, I finished scanning “The Runes Of Doom”. (The smart thing would have been to scan the entire book at once, but scanning is boring, so I do a handful of pages at a go, enough for the next article or two, then procrastinate doing the rest, which is why articles are often late.) 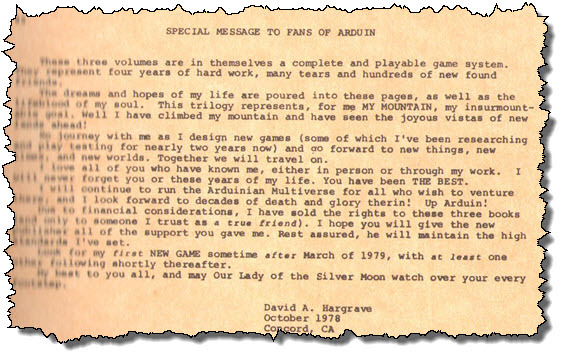 So it’s sort of an end of an era, or the beginning of the end of an era, or the beginning of the end of the first era if I move on to either other Arduin books or some of the rest of my immense pile of 70s-era gaming supplements. But it’s something, dammit! When I wrote the above, I didn’t expect this article to close out the series, or at least the original trilogy. But it does. Whoa. I’m going to pondering this for a while. INTPs don’t normally complete things unless there’s a boss and a deadline and a paycheck involved. Tel-Kroath: A 13′ tall, eyeless/wingless glass giant. It’s pointed out that it’s wingless, because the default assumption is, naturally, that 13′ tall giants do have wings. I presume it has a scorpion tail, though, because it does not say it is tailless. And horns, because it does not say it is hornless. And tusks, because…. OK, that horse is dead enough. Ah, but when he flies, fans of radiant light spread out from his body, like, erm, wings. His touch turns people to glass (as per petrification, but this is vitrification), and every three turns he can shoot an eyebeam to do the same thing. Thangumokk: An eyeless, winged (ah-hah! 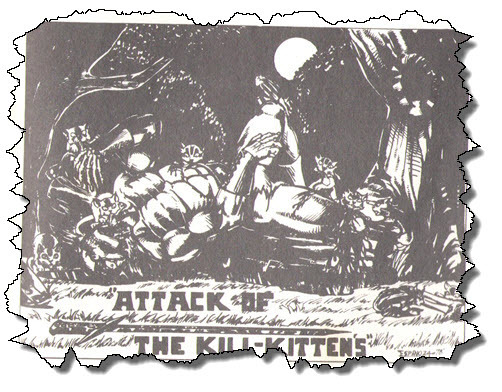 ), scaled, tailed, copper-colored 12′ tall humanoid. When angered, his color becomes “molten”. He spits acid, breathes poison gas, and carries around “green slime grenades”. His touch paralyzes “hobbits, kobbits, kobolds, and goblins”, which implies that it somehow interacts with the gene for “shortness”. In what may be my favorite bit of characterization of demons, he enjoys appearing as a mangy dog or scruffy stray alley cat, presumably to lure in prey. His favorite food is “hobbit, etc.”, which sounds like a 90s mall store. (“Muffy and Mitzie and me are going to go down to Hobbit, Etc., ’cause there’s a cute guy working in the stockroom!”) He is the “Patron Demon of all Goblin kind”. Thymorg: “Looks: Purple, leathery, lumpy, warty skin, stooped, 9 1/2′ tall,3-eyed (yellow) that cause confusion to anyone gazing into them within 10′ of him.” You wanna know what else causes confusion? That sentence! Well, it’s not a sentence, really, it’s more a string of words. His main attack is turning into a gaseous cloud that eats life levels. He wears the “Eye of Agamat” (cough, cough) which allows him to gaze anywhere in whichever universe he’s in. And, because we haven’t had one of these in a while, he’s the arch-enemy of BRYGHAUL. Urandos: “Generally man-shaped”, except for the giant bat wings, three eyes, and “crinkly tin-foil” skin. He’s got an “ice” theme going. Accompanied by ice demons, appears as a polar bear or “a warrior maiden with silver hair and eyes”, and so on. He is the arch-enemy of AMON-RA. He creates ice javelins that he can throw “very accurately”, which means he gets a bonus of… erm.. I mean, it allows him to ignore… uh… no, wait, he can attack even targets that are… uh… look, he’s very accurate, OK? Consider: As the “god of all Trolls”, he will appear 90% of the time if asked. Ninety percent??? Do trolls know this? If so, I would never, ever, ever, take on a troll in Arduin! You’d have a ninety percent chance of ending up facing a friggin’ 16 HD demon! 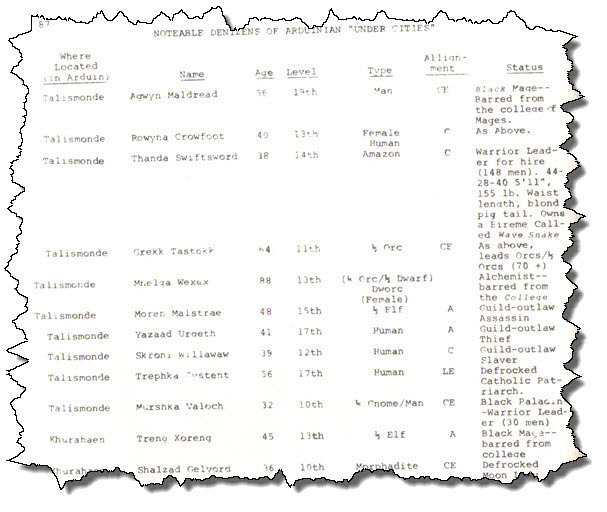 I’m also going to repeat my boilerplate rant about how so many creatures in early D&D and related had different AC for different body parts but no hit location rules. Vorcas: Like “orcas”, but with a “v”. It has eight taloned (that’s eight of them, each with talons) “feet/clawed hands” and three shark-like fins running down its back, culminating in a sting ray tail with a red stinger. Topping this off, literally, is a shark-like head with emerald teeth, which can bite for 5-50 points of damage. Favorite food: Sea elf. He is constantly at war with NAGANDAS but a mysterious and unnamed “friend” keeps intervening to prevent Nagandas from winning. 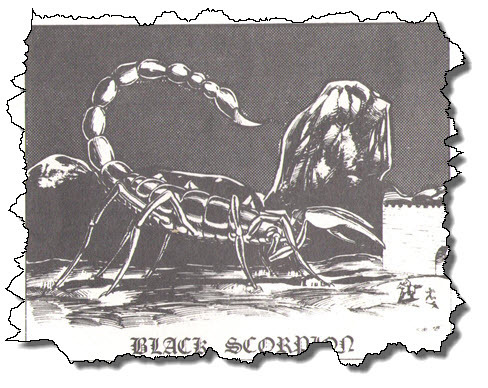 That’s the end of the demons… so here’s a black scorpion. Please Note The Size Of The Rider And Mount…. 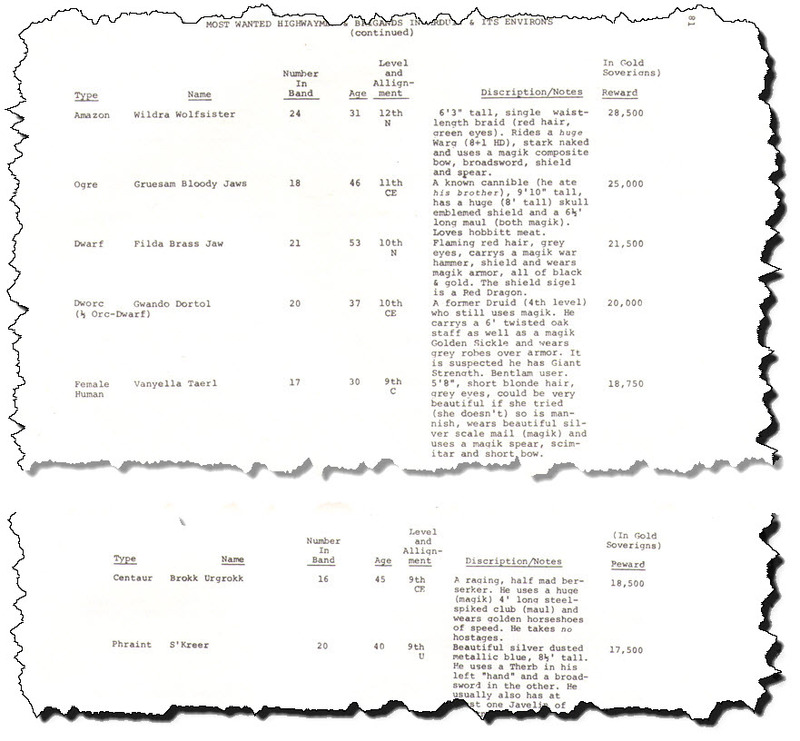 The remainder of the book, from page 78 to page 94, consists of lists: Noble Familys (sic) of Arduin, Most Wanted Highwaymen of Arduin, Denizens Of The “Under Cities” Of Arduin, etc. This leads to an interesting conundrum. There’s really not too much to comment on or call out; there’s a ton of interesting little snippets here, but it’s pure background detail. 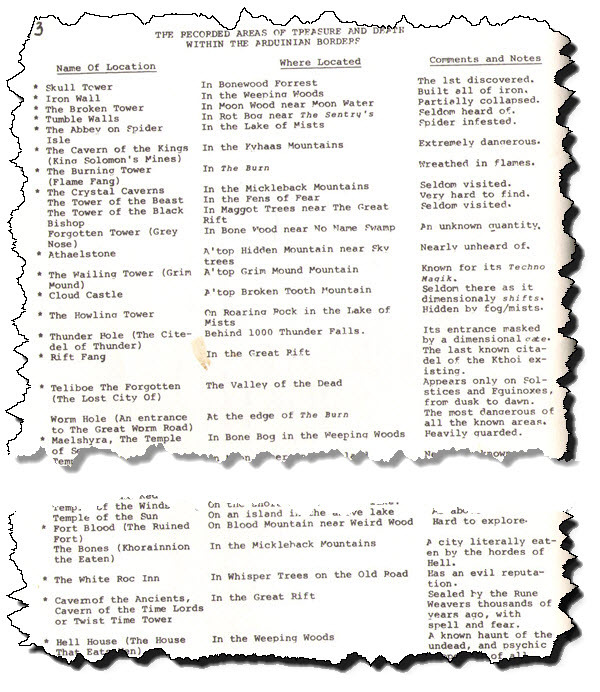 The most important thing I can say about it is, like the lists of coins and precious stones back in Welcome To Skull Tower, it served to greatly inspire me, as a teen, in terms of worldbuilding and thinking beyond the dungeon. Reading these lists, you get a great sense of how much there could be to create in a world, how many aspects of it there were to consider. Simply seeing the possibilities was enough to get me thinking about what I may have missed or what I could fill in. 1/2 Orc-Dwarf Druid? Anticipating 3.0 Again! 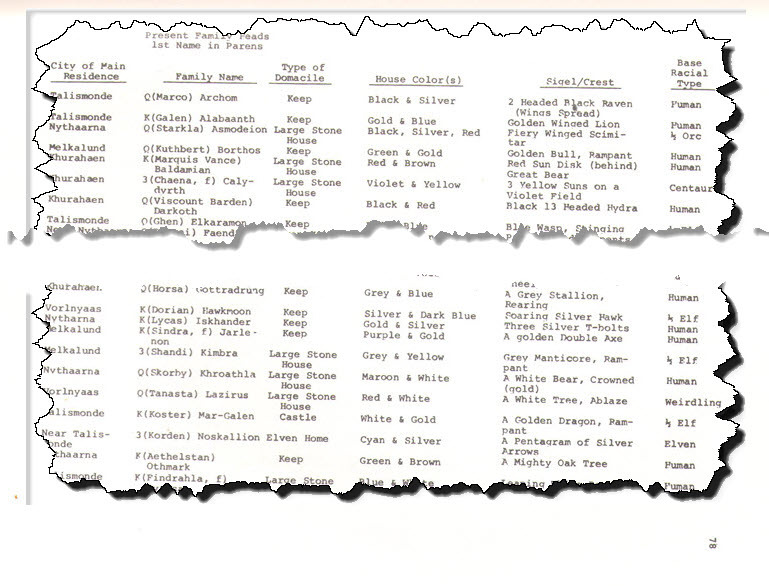 It’s unfortunate that even by Arduin standards, this list is marred by spelling and other issues… “Gruesam”? “Cannible”?… because this is a truly remarkable collection of highly distinct characters, albeit compressed into virtually statless form. I mean, at best, it mentions “magik” weapons or armor, no specifics as to bonuses or other enchantment. And when it comes to inspiration, things like this taught me to think about NPCs in terms beyond “fourth level fighting-man”, but to give them visual distinctiveness and defining personality traits and quirks. And that, in turn, feeds into my love of the kinds of systems I prefer — high detail, high-crunch, systems such as GURPS, Hero, or Pathfinder. Why? Because I want the mechanics of a character to be as rich and deep as the description. I want to make characters who live up to their imagery in play, who aren’t just some fluff text laid on the generic statistics of a “fourth level fighting-man”. There’s A Lot Of Defrocking Going On. Giggity. At the time, I thought “undercities” was a term for “dungeons”, but later I started wondering if it meant, more literally, underground portions of the city… something between a dungeon adventure and a city adventure, a region sort-of citylike but more lawless and wild, hidden away beneath the more “civilized” realm above, yet still more orderly than the truly unexplored dungeons below. And here’s some haggorym. 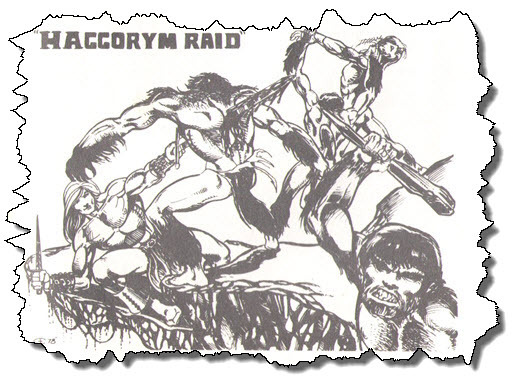 Haggorym are, if I recall correctly, caveman-hobgoblin crossbreeds. Try not to think about it too much. We won’t even discuss kobbitts. Seriously? “Cycle” Again? Did Hargrave Take Some Kind Of Course In Mythology About The Time This Was Written, Or What? Sheesh. And speaking of fun ways to die… my favorite Arduin beastie of all time. 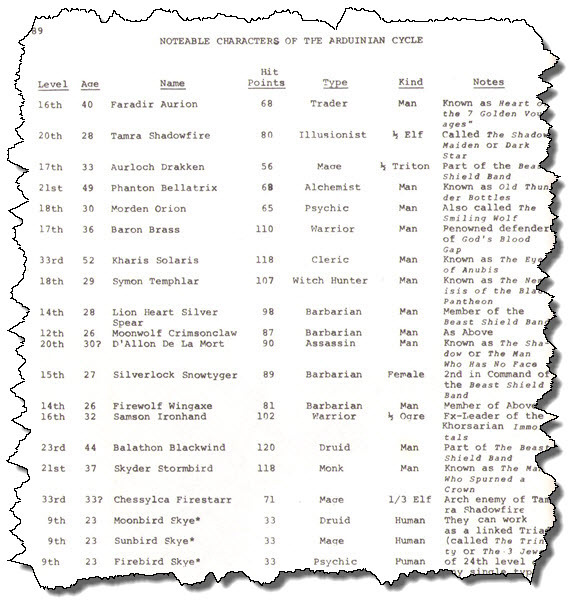 This either inspired GRRM to create something very similar in “Tuf Voyaging”, or, it was inspired by them… the overlap in timelines is complicated, and GRRM was an RPGer who moved in the same circles Dave Hargrave did, so, who knows? Otherwise Known As “Every Morning About 5 AM”. Huh. I totally forgot this was in here. This was something I never really imitated, I guess. Most of my games were/are set in highly “civilized” (ideally, decadent) regions, because I have a thing for cities, ruins, etc. The Abbey On Spider Isle Is Spider Infested. Good To Know. So, that’s the end of the trilogy. I’m probably going to switch gears for a little bit… this is the longest, most regular, thing I’ve done on this blog. I also need to get back to some fiction writing. (Got a sequel to write.) I’ve got a partially done walkthrough of an obscure 90s game, “Of Gods And Men”, that’s been languishing in the “Drafts” folder for over two years now, too. Might get that done. Who knows? As usual, I’ve got a dozen or more projects waiting for some vague attempt at focus and completion. We’ll see what happens. Always in motion, the future is. Trying to come up with something uplifting, meaningful, and pompous here, probably involving roads, or maybe some twaddle about how the spark of inspiration finds fertile kindling in the drought-stricken undergrowth of the parched brain, but nothing’s coming. Whatever. I hope people enjoyed this expedition through the tangled jungles of nostalgia. 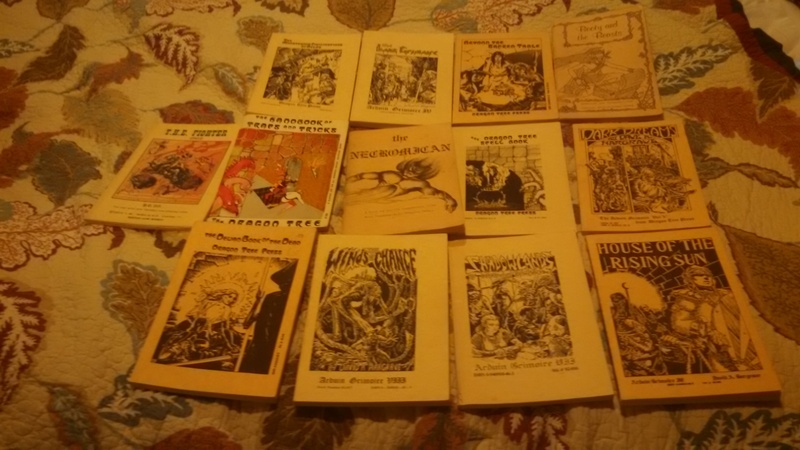 You do of course realize that after ending this trilogy Dave Hargrave published six more grimoires and well as a second edition. Checked my Emperor’s Choice Trilogy reprint, indeed it is a “palp.” The interweb says “palp” is another term for “palpus”, a zoology noun meaning “each of a pair of elongated segmented appendages near the mouth of an arthropod, usually concerned with the senses of touch and taste.” Makes perfect sense. Dave means what he writes, apparently. Much as with EGG, he wrote for those with rich vocabularies, and figured if you couldn’t glark the meaning from context or look it up, you weren’t the target audience. The undercities of Arduin are what Skull Port is to Forgotten Realms. Maybe even worse! Please do more on Arduin. It’s endlessly inspiring. This series has been excellent…a fantastic piece of work on your part to go through all this. 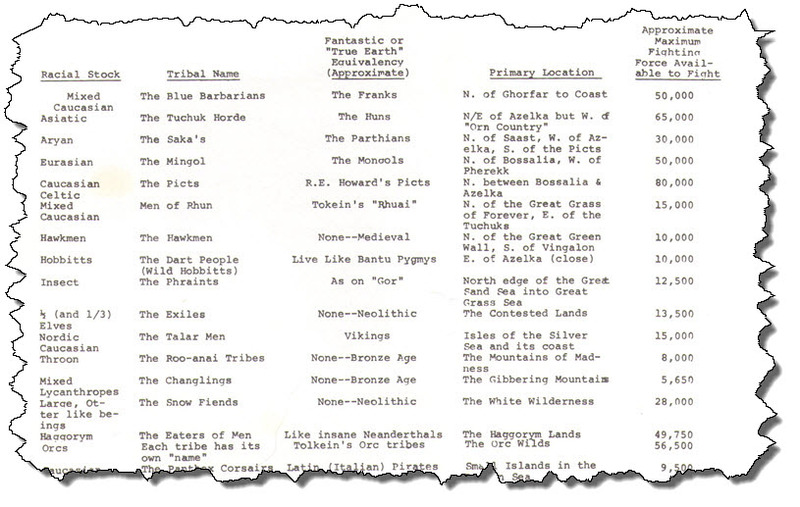 – The tribe of Phraints are “as on Gor?” Were phraints inspired by Norman’s insectoid priest-kings? – The top-listed brigand/highwayman is a naked, wolf-riding Amazon. What does she do with the stolen loot that’s necessitated the huge price on her head? – The character of Boba Fett was in the original Star Wars film, but his scene was left on the cutting-room floor. Hence the release of a BF action figure prior to the second film of the series. Good luck with your other projects. Thanks again for your work on Arduin! I believe that Boba Fett was created for Empire… but was “previewed” in the legendary Star Wars Holiday Special, in a cartoon by Nelvana (which many people remember as the only good part of the special), hence, the early toy. I’ve not seen a reference to him being part of any of the early drafts of Star Wars, but I’d be interested in being proven wrong. Ha! You’re right! I hadn’t realized that his inclusion in the “special edition” version of the first film was a CGI insert into the restored scene with Jabba the Hutt. The Holiday Special was his first appearance, before the toy.